Since year 2006 to 2010, from November to January that I called it the new year season. there are always something coming for day time visiting : such as golden disk, light ball……. This year about 7 different type of them. 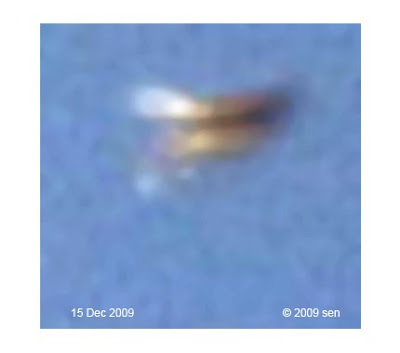 This image shows two flat-top disk shaped UFOs flying parallel together above my tree, taken on 15 Dec 2009. It was also captured on 13 Dec 2009, these two same colored invisible round disks hung up in the sky side by side. it’s diameter less was than 1 metre(? ), One of them emitted some white light.